When it comes to football clubs, it’s a natural response to start talking about the players, the managers or the fans. Many don’t tend to think about all the hard-work that goes on behind the scenes. A job that certainly falls into this category, which is extremely under-valued and indeed underestimated, is the groundsman. The role they play in making sure games are played weekend after weekend cannot be stressed enough. Without them, football wouldn’t happen. Groundsman in Cornwall face the same battle every week against our ever changing climate and unpredictable weather conditions. It’s the same for others up and down the country as the challenge to make sure games go ahead this winter is bigger than ever before. A congested schedule of fixtures adds to the required upkeep of pitches, whilst rainfall ultimately dictates the maintenance needed. The Cornish FA are doing everything they can right now to help local clubs as much as they possibly can. 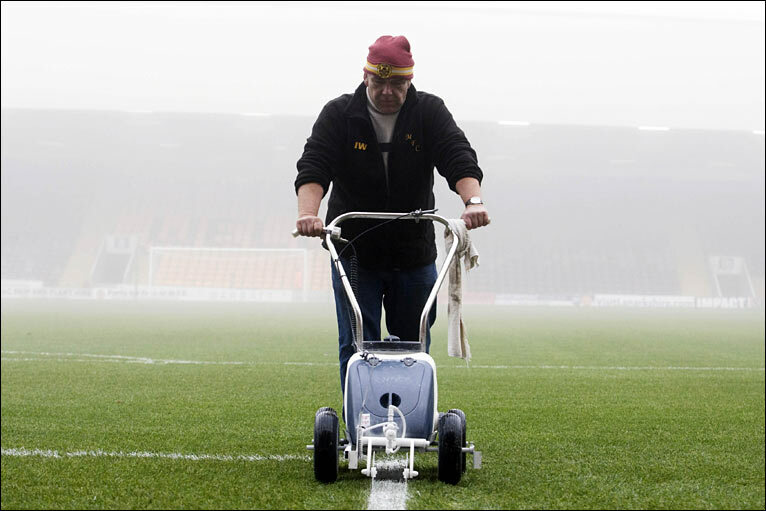 The most recent event put on by the football authority included a groundsman awareness event, where members of clubs from all over the county attended to receive tips on pitch maintenance, the latest technology available and the support available for them. Over 500 games were cancelled in the build up to Christmas in Cornwall alone last season and measures are being put in place to stop the number of cancelled games reaching this number again. “I think the event has been really successful. When we first had the idea to do an event like this we were conscience about the geographic challenges of Cornwall. We’ve attracted people across the county and that just shows the passion across the county to support and develop our grass pitches. As we move forward, we’ll look to do an east and west spread to attract even more people. I think for our first event to get over 30 people here on a cold Wednesday evening is very good, I think we’ve done really well,” said Daniel Greenough, the Senior Football Development Officer of the Cornwall FA. “Tonight has been a really good eye opener for clubs to show what support the county FA can provide and the projects and programmes that are available for them to tap into. There’s a lot of clubs that are unaware of things they can tap into so tonight was around that and then hopefully as we move forward, it will be about creating those networks and groups of people that can support each other,” Greenough added. It is evident that the Cornish FA are on hand to help local clubs, bringing in pitch advisors, machinery workers and lawn cutting professionals at such events to ensure groundskeepers are doing the right things moving forward. The Institute of Groundsmanship (IOG) also plays a big role, acting as the world’s largest not-for-profit organisation representing grounds men. It’s not until you attend an evening like this that you realise how much goes on behind the scenes at a football club – something that a lot of fans fail to realise. The IOG and the FA are also constantly working together to drive down prices of machinery and floodlights for football clubs in order to give them the best possible deal for their budget. Money isn’t always easy to find in the tenth tier of English Football like it is for Manchester City in the Premier League. “Because the FA are putting in up to 50 percent of the cash, obviously the club may only have to find seven and a half thousand which can be crowdfunded. It doesn’t all have to be someone pumping money in,” said John Scott of Vincent Tractors, who were showing a visual demonstration of maintenance on the pitch at the event. Leuan Gregory, a long-serving groundsman at Hayle AFC, said: “It was useful this evening because it’s told us that there is help out there and it’s something that has been missing in Cornwall for many years. The groundsman has always been at the bottom of the ladder and it ’s not just my club, it is most clubs in Cornwall. The groundsman is the guy who turns up on the Monday morning, does all the work during the week, and when the players turn up at half past one on the Saturday they think some magic fairy has been in. Groundskeeping isn’t a science, it’s an art”.